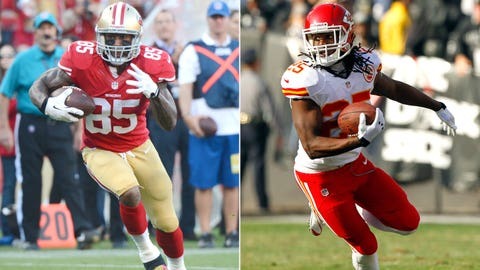 Vernon Davis (five straight games with one TD) and Jamaal Charles (five TDs last week) are top-five assets at their respective positions for Week 16. 1. For the season (14 games), Chiefs tailback Jamaal Charles (215 total yards, five TDs vs. Oakland last week) has notched 100 total yards and/or one touchdown 12 times. And in case you’re scoring at home, Charles has logged 10 touchdowns in his last four outings. Speaking of finding the end zone, Davis caught five balls for 106 yards and one TD in his last encounter with the Falcons — the NFC championship in January. 3. New England’s Julian Edelman (19 targets last week) is on the oh-so-exclusive list of NFL wideouts to post three games of 100 yards receiving and double-digit targets in the last four weeks. The other member of that club: Josh Gordon. For good measure, Edelman also has four touchdowns in that span. 4. Dating back to last year, the remarkably consistent Matt Forte (1,722 total yards, nine TDs) has rolled for 95 total yards or one touchdown in 18 of his last 19 games. 5. Jay Cutler (three TDs last week) simply can’t lose when throwing to Brandon Marshall and Alshon Jeffery 25 times per game. 6. Broncos quarterback Peyton Manning, who could hit 5,000 yards passing and 50 TDs by Sunday, boasts supreme averages of 363 yards passing and 3.8 touchdowns in his last three games. 7. Of his last eight outings against NFC clubs, Lions wideout Calvin Johnson has tallied 100 yards or one TD seven times. 8. Of his last nine outings, Bengals wideout A.J. Green (18 targets last week) has racked up double-digit targets or one touchdown eight times; and against NFC North foes this season, Green holds elite-level averages of 121 yards and 1.3 TDs. 9. Eagles wunderkind LeSean McCoy (1,850 total yards, eight TDs) draws a juicy home date with the Bears, the NFL’s worst run defense. For good measures, Shady has also racked up 100 total yards and/or one touchdown in six straight games. 10. For what it’s worth, Matt Schaub has averaged 300 yards passing and 2.5 touchdowns in two career starts against the Broncos — including last year’s 290-yard, four-TD demolition in Denver, outdueling and defeating Peyton Manning (330 yards passing, two TDs). 11. Matthew Stafford wasn’t his typically sharp self against the Ravens, but there’s a big difference between Baltimore and the imploding New York Giants — especially at Detroit’s Ford Field. Of his last six indoors games against NFC foes, Stafford has averaged 332 yards passing and 2.3 total touchdowns. 12. Of his last five games, Cowboys tailback DeMarco Murray holds sublime averages of 126 total yards and one touchdown. Of equal importance, he logged 17 or more touches each time. 13. Josh Gordon draws an elite-level ranking for the week, a reward for absurdly amassing 841 yards receiving and six touchdowns in his last five games. There is, however, one tiny concern against the Jets: Of his last eight games, Gordon has collected three or fewer receptions three times. 14. Here’s your quirky stat of the day: Fourth-year tailback Ryan Mathews has never logged 10 or more carries in a single game against the Raiders, the Chargers’ most heated division rival. Here’s a better stat: Of his last nine games, Mathews has amassed 92 total yards and/or one touchdown eight times. Of Dallas’s last seven games, the Cowboys defense has succumbed to staggering averages of 461 total yards per outing. 17. Alshon Jeffery, who earns a higher ranking than Bears teammate Brandon Marshall against the Eagles’ porous pass defense, already has five outings of double-digit targets and 100 yards receiving. Plus, of his last three games, Jeffery (80 catches, 1,265 yards, seven TDs) has four touchdowns. 18. Kansas City’s Alex Smith (3,160 yards passing, 24 total TDs) isn’t a strong candidate to replicate last week’s five touchdowns, but that’s no reason to worry against the Colts. Of his last five outings, Smith holds rock-solid averages of 272 total yards. Plus, he racked up multiple touchdowns each time. 19. Pittsburgh’s Antonio Brown has already posted 10 games of nine or more targets this year. Boosting his fantasy stock … Brown has notched six games of 100 yards receiving or one touchdown since Week 9; and in that span, he has seven total touchdowns. 20. The Titans have a seven-game scoring average of 26 points. What’s more, running back Chris Johnson (1,188 total yards, nine TDs) is on the precipice of a sixth straight season of 1,400 total yards.